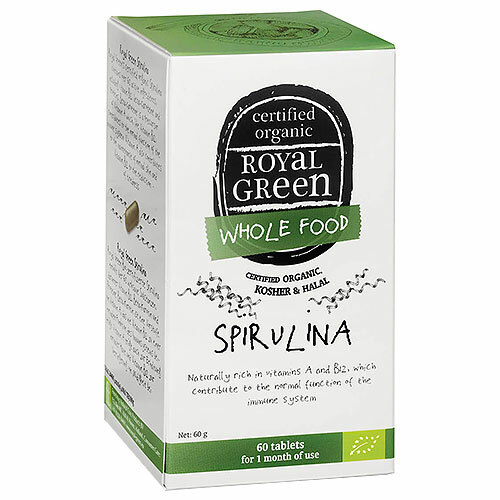 Royal Green offers spirulina in it`s purest 100% certified organic form, where no pesticides or herbicides are used whatsoever. Certified Kosher and Halal. Royal Green certified organic Spirulina contains over 60 active ingredients like vitamin B12, beta-carotene and proteins. Beta-carotene is a precursor of vitamin A that, like vitamin B12, contributes to the normal function of the immune system. Vitamin A also contributes to the maintenance of normal skin and vitamin B12 to the reduction of tiredness. 1 tablet twice a day, preferably with a meal. Do not exceed the recommended daily dosage. Consult an expert before use in case of pregnancy, lactation, illness of medicine usage. 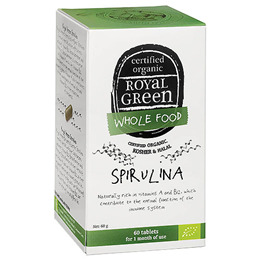 Below are reviews of Royal Green Wholefood Spirulina - 60 x 1000mg Tablets by bodykind customers. If you have tried this product we'd love to hear what you think so please leave a review.